Ever since I got my bottle of Buffalo Trace Bourbon, I have been wanting to make Juleps, thinking, like the great Mary Poppins, that, 'a spoonful of sugar helps the medicine go down.' Not that I don't like bourbon - after a little experimentation (which you can read about in my previous post, Kentucky Fried) I actually got a bit of a taste for the stuff, but a little sweetness always helps and I am rather partial to mint, so the traditional Mint Julep seemed like a winning combination. A publication from 1803 describes the Julep as 'a dram of spiritous liquor, that has mint in it, taken by Virginians in the morning.' Well, yee ha to that! What a jolly place Virginia must have been around breakfast time. Apparently it was considered a morning drink (much as we would have an espresso, perhaps) that was popular with the farmers of the agricultural eastern and southeastern states who would be working from dawn. In 1938, the Churchill Downs racetrack, home of the Kentucky Derby, began serving Mint Juleps in souvenir glasses at 75 cents and so the drink became synonymous with the event and anywhere between seventy to a hundred and twenty thousand drinks are sold every year over the two days it runs for. 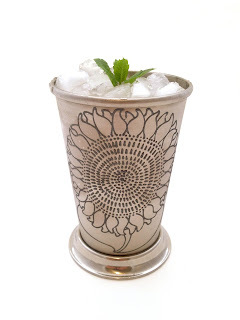 Nowadays, the Julep is generally sold in a tall glass, but the traditional way, is to serve it in a pewter or silver cup, that hass to be held around the flared base to avoid transferring heat to the drink and melting the ice. 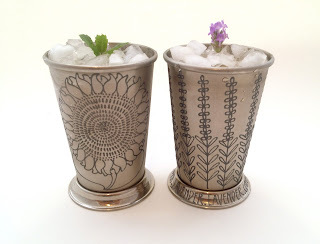 I really wanted to be able to serve my Julep in the traditional Julep tin and after much searching, managed to track some down and give them a Toasted Glass makeover. The Mint Julep and the Lavender Julep were both easy enough to make and certainly made an attractive cocktail, but I just kept wishing there was some lemon in there too. So, for me, from now on, my Julep will contain a 1/2 oz of lemon or lime, which means it's more of a Sour than a Julep, but hey, my drink, I can do what I want. I suggest you try the traditional way and see if you like it and if not, stir in bit of lemon or lime and see what you think. Add the mint leaves and muddle gently so as to release the essential oils but not so much that it will taste 'leafy'. Add the bourbon and fill the glass/tin with crushed ice, then stir until the outside of the glass/tin becomes totally frosted. Take the final sprig of mint and slap it gently between the palms of your hands, to release the minty aroma and pop it atop the ice. Make like Scarlett O'Hara or Rhett Butler and sit out on the veranda sipping your Julep. 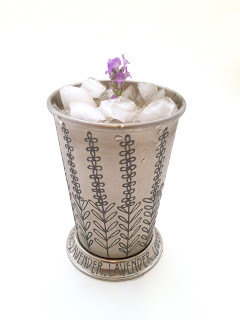 Remove the flower buds and muddle gently in the bottom of the glass/ tin with the lavender syrup. Take the final head of lavender and slap it gently between the palms of your hands, to release the floral aroma and pop it atop the ice. If, like me, you are more of a gin lover, then you should definitely try it with gin, in place of the bourbon. I rather enjoyed it that way, although best of all, was with a little lemon too. Let me know how you get on.